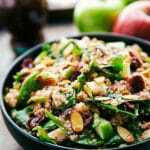 A simple quinoa salad with toasted almonds and sunflower seeds, a chopped apple, and dried cranberries. This salad though!! #1: EASY, #2: so quick to throw together, #3: HEALTHY, #4: deliciiious. Optional #5: kid friendly (or at least for my kiddo it is). Although, admittedly I’ve heard it’s strange that I can get a 2-year old to eat salads and lettuce the way he does. It’s really nothing I’ve done, he has always loved lettuce. He’ll eat just about every variety, plain or dressed. He loves salads! And it’s no surprise quinoa is (I think) his favorite food since quinoa meals show up on the regular here. The few times we’ve made this, he has out-eaten me! Me, the one that is supposed to be “eating for two” mind you. 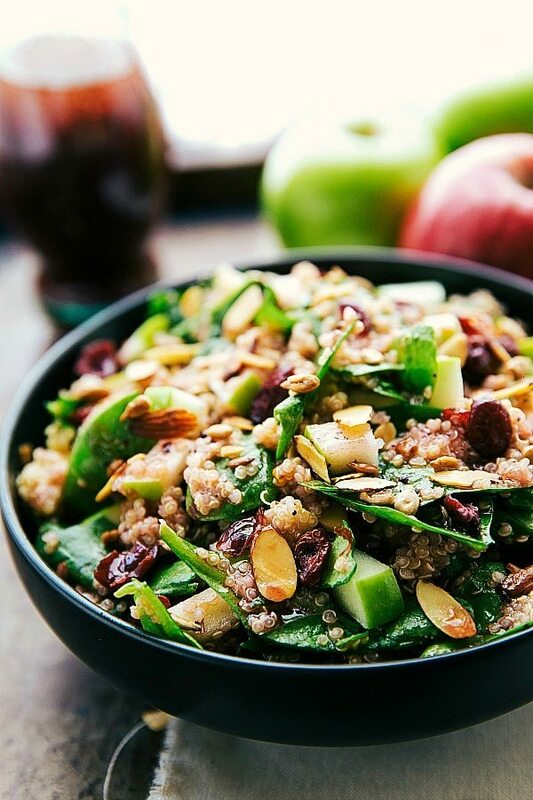 Mixing together quinoa, spinach, some crunchy almonds + sunflower seeds, chewy dried cranberries, and a tart apple with the most delicious raspberry vinaigrette ever turns out to be one heck of a salad. If you wanted to add some yummy marinated grilled chicken it could become quite a filling meal too. So let’s talk dressing first. I’ve made this salad with a store-bought dressing and then my own homemade dressing. Both are honestly great with this salad. The store-bought dressing I use is a raspberry walnut vinaigrette (used on this salad too! It’s called Ken’s Steakhouse Lite Raspberry Walnut Vinaigrette for anyone wondering the exact brand.) I’m totally crazy about that dressing and love it with these ingredients. Of course using a store-bought dressing will cut down on preparation time and make this salad super simple. 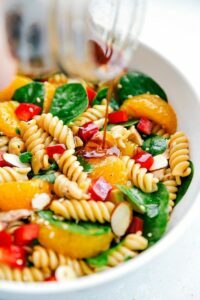 But if you have some extra time or prefer your own dressings, the raspberry vinaigrette recipe listed on the recipe below comes together super quick. Just throw all the ingredients in an immersion blender and voila – homemade dressing is ready to go. While the quinoa is cooking, you’ll definitely want to lightly toast the almonds and sunflower seeds. It adds SO much flavor so don’t skip this step! Plus it only takes a couple of minutes to do. Just make sure to watch carefully as the nuts can go from perfectly toasted to burned really quick. The apple we like best is Granny Smith since the tartness balances out the sweetness of the cranberries and dressing. However, if you really love a different variety, I’m sure it will be great chopped up in the salad. You can peel the apple or leave the peel on whichever is your preference! 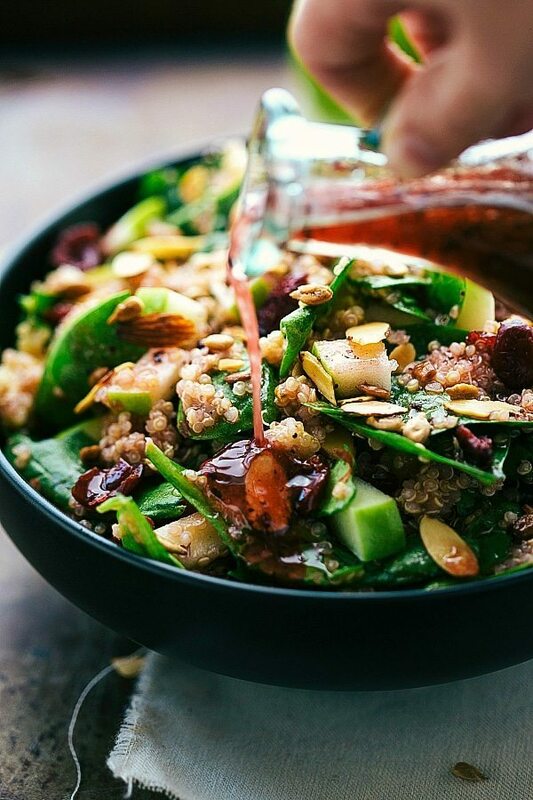 A delicious chilled quinoa and spinach salad with a tangy delicious raspberry vinaigrette. Rinse your quinoa in a fine mesh sieve to remove the bitter saponin coating. In a small pot combine the quinoa and chicken broth, vegetable broth, or water. I always use chicken broth with the quinoa, but if you are vegetarian the other two will work great. Follow package directions to cook the quinoa. Meanwhile, add the sliced almonds and sunflower seeds in a single layer to a completely dry skillet (don't add any oil) and place on medium-high heat (don't want it too hot or they will burn). Stir the nuts and seeds every 15 seconds for about 1-2 minutes or until the color slightly darkens and they start to smell good. Watch these carefully as they can go from perfectly toasted to burned quickly! Chop up the apple (peel if desired, I like to leave it on) and toss it with the lemon juice. Remove the quinoa and allow to completely cool (I put it in the fridge). 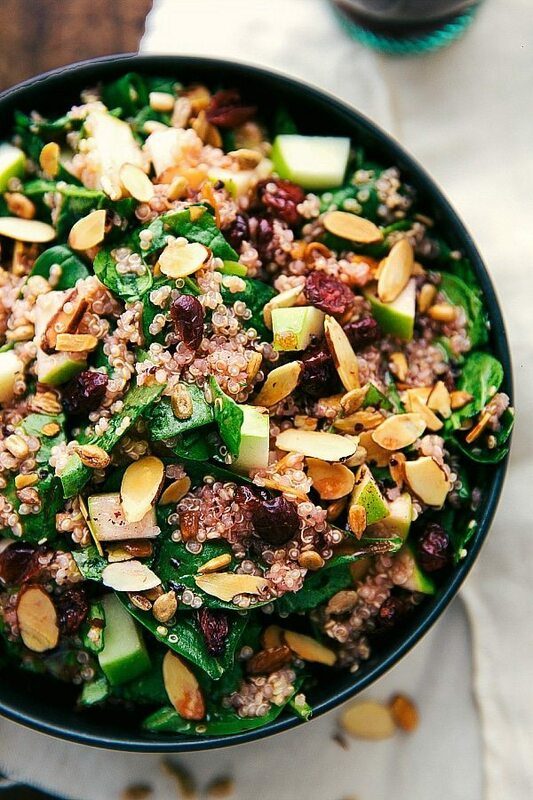 Mix together the spinach, dried cranberries, chopped apple, and completely cooled quinoa. Toss with the dressing (use as much or as little as desired; you'll likely have a bit extra to use on another salad!) and top with the toasted almonds and sunflower seeds. If desired, add in some feta cheese or another cheese you enjoy! THIS is how I like my salads — loaded with tons of healthy, but delicious ingredients. Love this! I love the quinoa laced throughout! Oh, this looks so fresh and pretty! I love making my own raspberry vinaigrette….especially since we have access to so many berries right now in Utah. This salad is so beautiful and really screams fall! Mhmm this looks delicious! I love adding sweet elements to my salad and I bet the texture from the almonds is fantastic! I was literally just looking for salad recipes with quinoa when this popped into my email! How serendipitous! Such a beautiful salad!! And so perfect for Fall! This salad is just gorgeous, Chelsea! I love how easy it is to whip up and the delicious flavors in here. 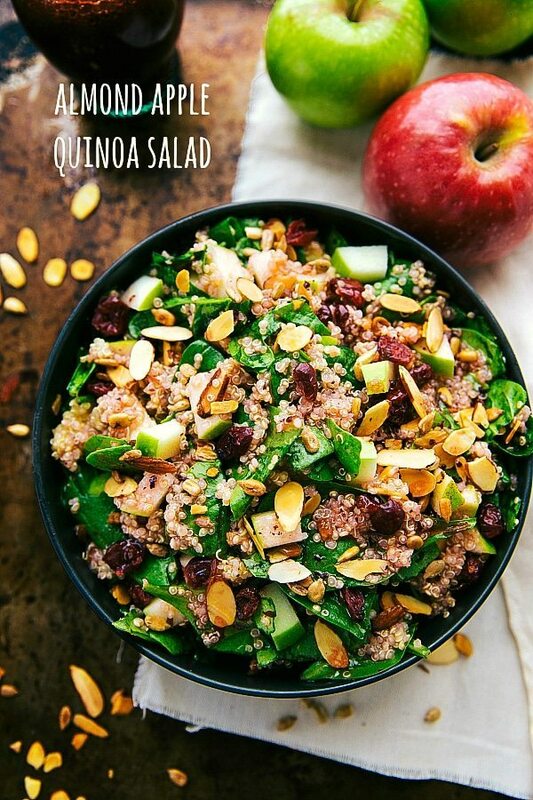 Apples are perfect to add with quinoa, yum! This is the perfect transition recipe to fall cooking, I love the brightness and freshness. Pinning! Oh this is totally my kind of salad! Love the apple (yay fall!) and that dressing sounds wonderful! Happy weekend!! This looks amazing Chelsea, I’ve got a serious craving now! I love all the colors in this dish too, so bright and refreshing! Thanks for sharing. 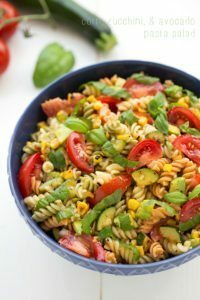 This is such a gorgeous salad! My 3 year old has always loved veggies and salad, so I totally get that! I think she would love all of the fruit in here! It’s amazing how much those little tummies can eat, both my kiddos can out eat me too haha. This salad is gorgeous, Chelsea! I love how loaded it is with all the crunchy almonds, sunflower seeds and sweet cranberries! This will be fun to try! I already incorporate quinoa into a variety of other things (often instead of couscous) so it’s good to have another recipe in the queue. (I will skip the feta however.) Cheers! Made this for my Bunco group the other day – delicious! I waited till the last minute to add the nuts and dressing. The apple really adds to it! Yum!! Making it again for a Thanksgiving side dish. Has anyone meal prepped this salad? How far in advance can you/do you suggest making it?